:&quot;Joshua by Stephen Grant Moses had died and the Lord instructed Joshua to take his place and lead the people. In obedience to the Lord, they crossed the River Jordan and began many years of conquest. Obstacles are overcome, battles are won, nations are defeated and land is occupied. Despite the failures, Joshua carried out his task in leading the nation into the land and, with God&#39;s help, subdued it. Judges by C T Lacey Spiritual anarchy, disobedience to God&#39;s word, idolatry, an increasing tolerance of immorality, a lack of unity among believers and their unwillingness to walk a pathway of separation to God are features of this present day, as they were in the times of Judges. Believers will do well to heed warnings and recognise the downward spiral awaiting those who pursue such a course. 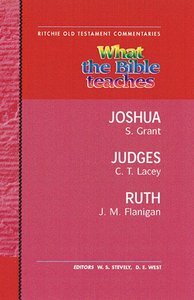 About "What the Bible Teaches #06: Joshua, Judges, and Ruth (#6 in Ritchie Old Testament Commentaries Series)"